Today in the decluttering sentimental items series we're decluttering kids' work. This can be artwork, as well as school papers, including school work, newsletters, report cards, awards, certificates, etc. Now, not all those things are necessarily clutter. It's up to you to decide what you want to keep, based on how much space you have and how often you or your kids will look through it. And you can choose whether to declutter your own school related sentimental items, or your kids' items, depending on your life and what items you have. By the way, I've got a special treat for you to reward all your efforts decluttering sentimental items this month! Details are later in the post. It's hard to let go of all the special things we made as a child or that our kids made when they were little. Time and energy and creativity went into them. And it's a special way to remember kids at different ages and stages. Plus it feels terrible to toss those creations in the recycling or garbage. But we can't keep everything... there's just too much! Well, I supposed if you have a huge mansion with tons of room, you can keep a lot of it. 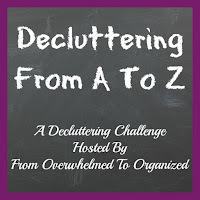 But chances are, if you're in this group, you're trying to reduce the amount of stuff you have in your home, so let's go with the assumption that you can't keep it all. 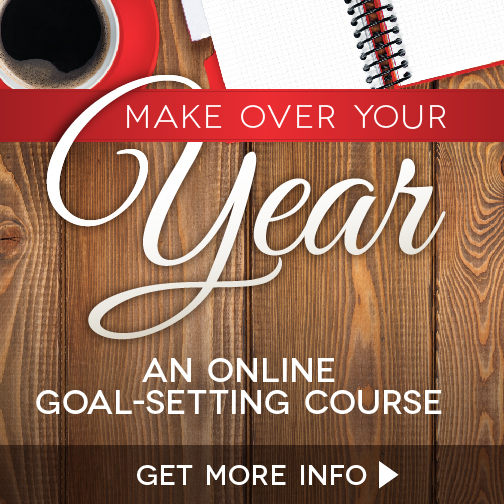 Here are a few tips to help you decide what to keep and what to let go of. Just like with other sentimental items, the key here is finding the treasures. Your absolute favourites! Keep those and let go of the rest. Keep items that showcase the child's personality or skills. You may also want to keep one or two items per year that show their development. Let your container size set a limit for how much you can keep. When it's full you need to let go of some items before you can add more to it. You can take pictures of kids' work and then let go of the originals (helpful if you are short on space). See the next section for ideas of things you can do with the digitized work. For my kids, we usually keep all report cards, awards/certificates, programs from school concerts/plays, and a sampling of their work throughout the year to show their progress. They usually choose a few of their favourite projects too. In their younger years we kept more artwork, but now it's more actual work. I use clear plastic file bins similar to these (affiliate link). 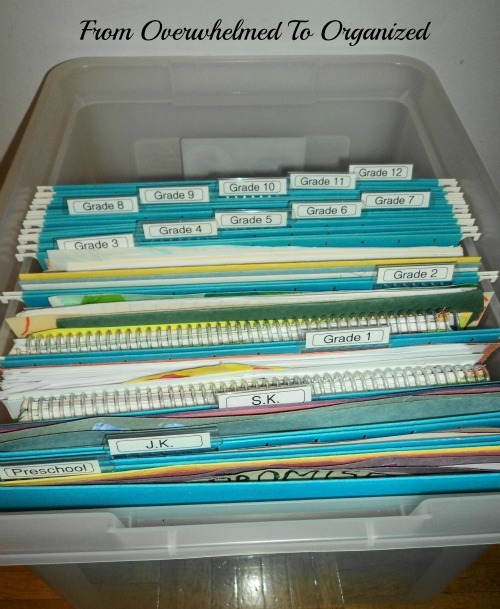 You can read more about my file bins system and see pictures of it in action in my Command Center here. When my kids were really young I made most of the decisions on what to keep or not, but now I make them decide... since it will be their memories to keep when they're older. They're getting better at deciding which items are most important to them and letting go of the rest. As they get older, I think they will likely be more willing to let go of even more. In addition to their school file bins, I keep most of the things they make for my hubby or I as gifts and will have a small bin of those to keep when they leave home. For my own school items, I've got a school memory book with a pocket for each grade - similar to this school memory book (affiliate link) but mine goes all the way from Pre-Kindergarten to the end of High School. I've kept most report cards and a couple of items from each grade (mostly younger grades). The older grades' pockets have more items related to clubs or activities I participated in. I recently recycled nearly all of my old files from high school, university, teachers' college, and grad school as well as all files from former jobs. I never looked at them and I was tired of how much space they took up in my basement. Now I'm down to 1 bin, and I'm actually in the process of transferring it into smaller bins by "eras" of my life so I can more easily flip through it from time to time. It's up to you what you keep. But if you are short on space, then choose the treasures and let go of the rest. Especially if you never look at these school items. 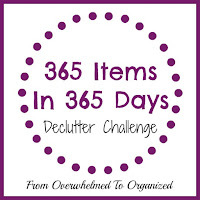 Whatever you decide to keep, make sure you store it in a waterproof container (check out day 5 and my recommendations for storage bins if you haven't read it yet). We had a flood in our basement several years ago and lost a bunch of my hubby's grade school notebooks because they were in a cardboard box and we hadn't transferred them to a plastic bin yet. Now everything is in plastic. I can't think of any ways to reuse or repurpose children's work, but if you have some ideas, please let me know in the comments! But there are lots of ways you can display children's work. "We recently went through kids artwork that we kept from their younger years. Basically as time passes, you realize you don't need every piece and that some are just more desirable to keep than others. I think it helps to have a defined container so that you can only keep what fits." "I too kept a defined container. It did really help. My kids were small just before everything went digital. So, I have one binder that I kept "masterpieces" in. I put them in the plastic sleeves in this binder. I love going thru it :). I also framed one piece from each child and have them hanging in my bedroom." "The daycare centres and kindies my kids went to made folders for each child that was a gift to the parents at the end of the year. They already kept the cream of the crop, so it makes it easier with the guilt of throwing their hard work away. It is wonderful to be able to look back and see their development." If you frame artwork you can create a gallery of your favourites. You can also swap them out from time to time so you don't end up with too many frames. If you take pictures of kids' work you can share it with others through various apps or create photo books highlighting the best of the best of kids' work. A Special Gift For You For All Your Hard Work! 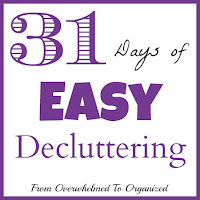 I've got a special treat for you as a reward for all your hard work decluttering sentimental items this month! Read on for the details. 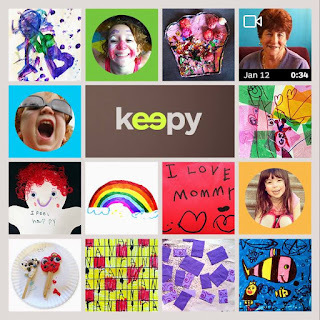 Keepy has free plans or paid plans, depending on how many photos / videos you want to include each month. 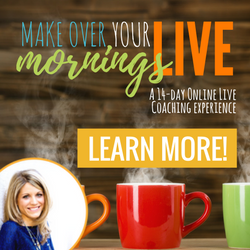 Check their site out here to see all the things you can do! 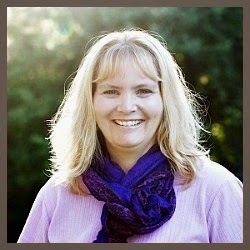 Keepy is offering a 20% discount off photo products for From Overwhelmed To Organized readers! So if you want to turn your sentimental kids' work into a photo book, magnets, coasters, mugs, or framed photos, now is the time to do it. Just use code DECLUTTER when you check out and you'll receive 20% off your entire order. But hurry, this offer is only available until October 31, 2016! How will you use Keepy? Why do you find it difficult to let go of kids' work? 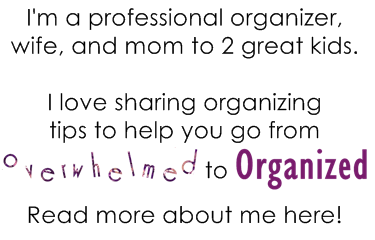 If you've decluttered kids' work, what helped make it easier for you? 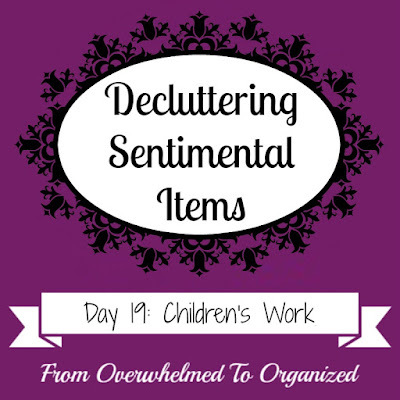 What tips can you share with those who want to declutter kids' work now? What ways do you display and/or store kids' work? 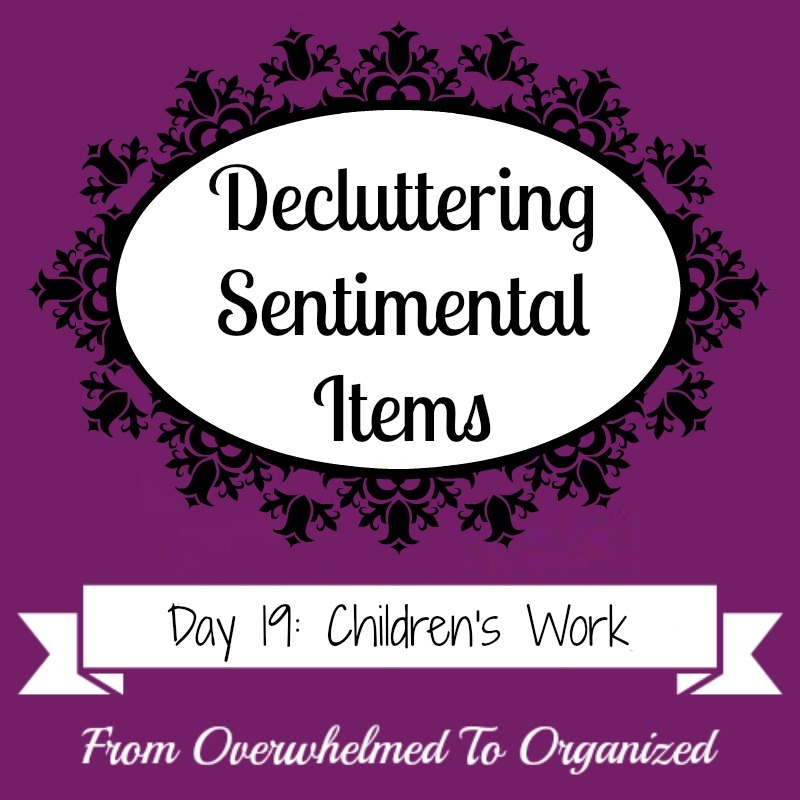 As you declutter kids' work, take pictures and share them on social media using the hashtag #declutteringsentimentalitems so you can inspire all of us to declutter our sentimental items! If you've got a picture of how you displayed or re-purposed school work or artwork, please share it in the comments or on one of the series' social media posts. I'd love to see how you are giving honour and respect to your sentimental items!